Editor’s inspiration: show off your crochet! Do you take pictures of your crochet projects? If you do – who do you show? Merion thinks we should be prouder of our creations! Over the last few months I’ve joined lots of fantastic groups on Facebook, and I have been so inspired by all the photos people post of their finished projects! It’s good to find fellow members of the crochet tribe – we all love yarn, we all love patterns – and the conversation never runs out! I don’t often take pictures of what I’ve made, but suddenly I feel I should. 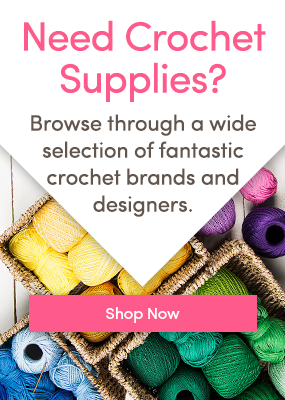 We have a fabulous area of the LoveCrochet and LoveKnitting sites especially for sharing – it’s called Projects – and I’ve been having a look to see the gorgeous items that have been posted lately! Surprisingly, there are a lot more knitting projects than crochet! We’ve got to put that right! I’ll start us off! This is my monochrome granny circle blanket, made for a friend who adores her greys! If you love a little bit more colour, you’ll love this absolutely gorgeous sunburst granny blanket from Sabrina R, it’s so pretty! Experienced crocheters might recognise that classic sunburst pattern – follow our brilliant Bella Coco tutorial on the blog to learn how to make it! There are lots of snowflake posts, thanks to our HomeStart Snowflake appeal – I love this one, from Joanne S – her first ever snowflake! Well done Joanne, it’s great! And if anyone would like the details of the Snowflake appeal, and the pattern, check the blog post here, and you can find the pattern here. On a Christmassy theme, just look at these fabulous figures! Catharina U posted this brilliant photo of Santa, an elf and Rudolf looking very festive! And who could resist this fabulous crochet cat, made by Annemarie for a friend who was taking toys to orphanages in Romania! What a fabulous gift for a little child – I’m sure this little kitty made a little person very happy. I can’t resist showing you our LC Angie’s Acer – when we launched the Acer CAL back in the autumn last year, Angie and I were making Acer shawls all over the place. This one is in Madelinetosh Tosh Merino in shade Wellwater. You can find the details of the CAL and the pattern on the blog, here. There are several posts with video tutorials and yarn reviews, so have a good look around! I’m in love with the colourway that Alison M has used for her Lavender Blanket in Rooster Baby Rooster – isn’t it exciting when you see the colours someone else has used? Come on Crocheters! Show me all your fabulous WIPs and finished works of art on our Projects page! Tell me in the comments below, and I might just feature you in a blog post soon! Editor’s Inspiration: Beatrice Baby Blanket crochet pattern by Little Doolally Editor’s inspiration: baubles and ssc (split single crochet) Editor’s Inspiration: My heart’s in the Highlands… Morning coffee: crochet ahead for the autumn, our summer CAL, leafy inspiration and very special friends to crochet from Kate Eastwood!